Direct Connection via underground passage to Otemachi Station. Sheltered from the elements, office workers enjoy comfortable access to and from the subway and area amenities via the underground concourse and pedestrian network. 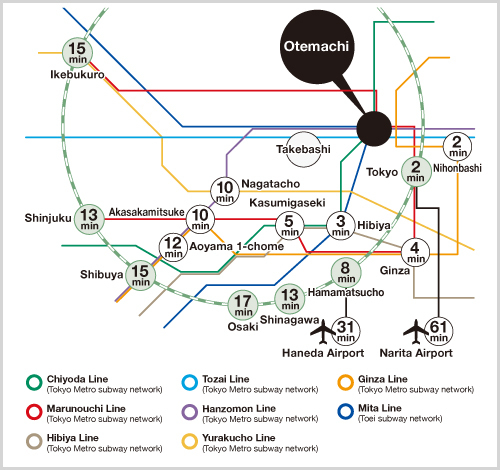 Convenient transport via 5 subway lines (Chiyoda, Hanzomon, Marunouchi, Tozai and Toei Mita lines) at Otemachi Station plus interurban, regional and national rail links at the nearby megahub JR Tokyo Station. 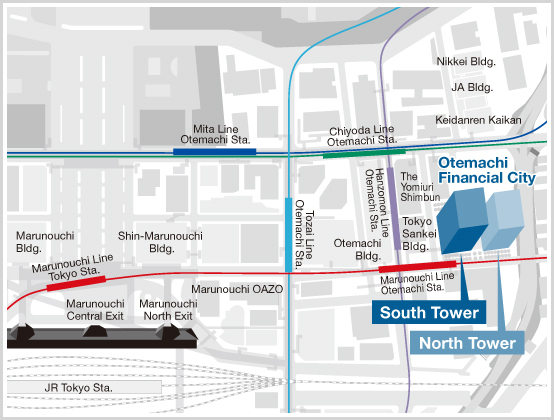 From Tokyo Metro Otemachi Station, use the passageway directly connecting to the first basement floor of the building. Then take the South Elevator from the first basement floor or the first floor to the fifth floor.